When you’re in the thick of minute-by-minute parenting and corralling little kids, there’s always that one sage parenting veteran who observes, “You’ll miss this one day.” And usually your first impulse (which you resist with all your might) is to punch that person in the face. 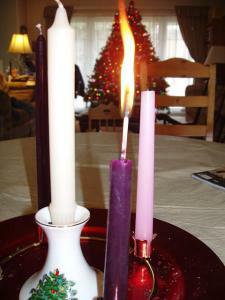 I am now that person, missing the crazy of Advent with 3 kids who enjoyed their Advent wreath a little TOO much. It’s easy to tell that whoever thought it was a good idea to observe Advent by putting candles on the table, in the reach of children, never had children themselves. Year after year after year I threaten to toss the regular candles in favor of the battery-operated variety, because in my house, Advent is where table manners and fire collide. The newest Candle Game involves sitting in your seat without leaning forward and blowing as hard as you can to extinguish as many candles as possible. Each person gets one chance, then it’s the next person’s turn. Asthmatics are definitely at a disadvantage in this game. (Ask me how I know). If you need some tips for keeping a relatively-safe Advent (fire and all) with kids underfoot, I’ve got you covered. But clearly, I didn’t miss my calling as an instructor in Charm School. A very wise woman from my parish (and the Secular Franciscans) who was herself the mom of 6, once told me I shouldn’t worry when stuff like this happened. “At least you know they’re normal,” she reminded me. Martha was one of those people who could find humor in any situation. And that’s what gets me through Advent, year after year after year. 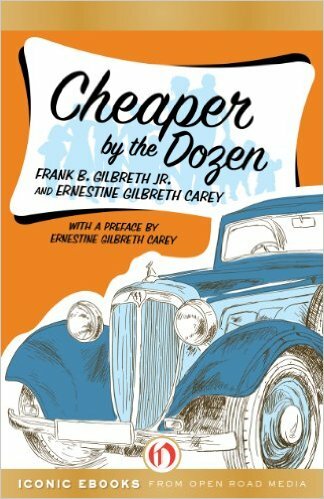 I’ve always been something of a Gilbreth geek. 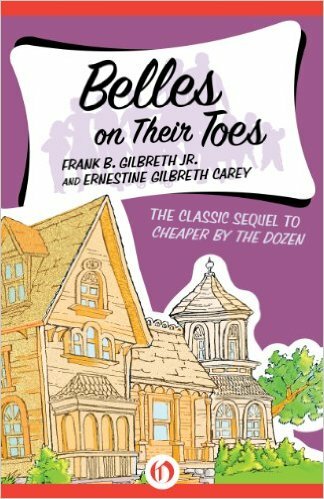 As a middle-schooler, I read Cheaper by the Dozen and Belles on Their Toes so often that to this day I can name the 12 Gilbreth children in order. 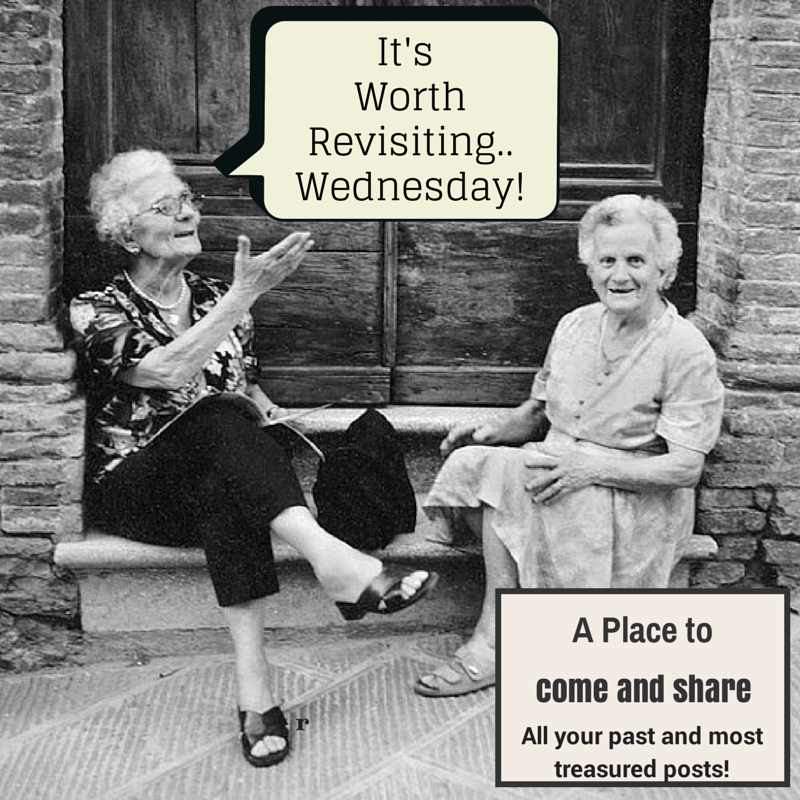 I even like the movie–both versions, the 1950 movie so true to the book and the 2003 movie that shares little besides a name with the original. My practical (and, let’s face it, lazy) side definitely approves of finding faster ways to do things. And right now, I am deeply grateful for my fascination with economy of motion. I’m hobbling my way through Advent. 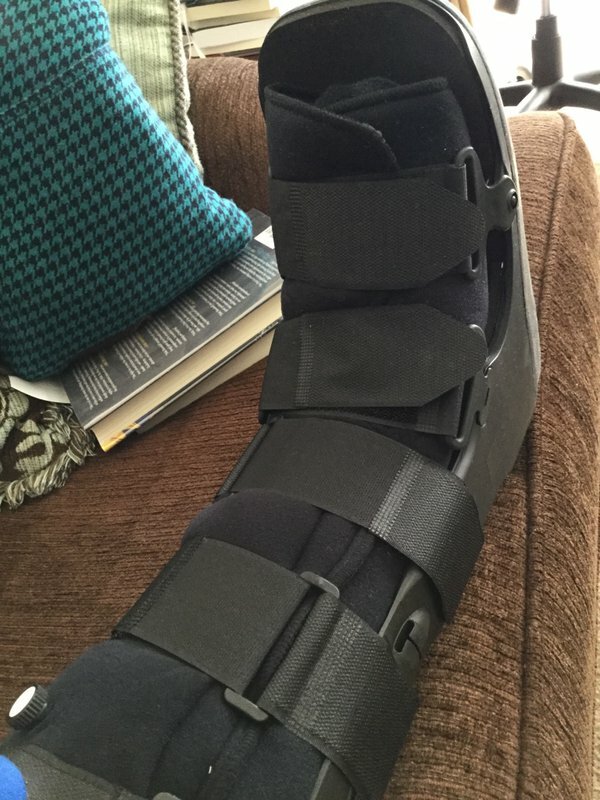 Two days before Thanksgiving, my doctor put my left foot in a boot to reverse a split in a tendon. My feet have been aching for more than two years. I’ve had cortisone shots, worn Ace bandages (stylish! ), lived on Advil, bought new shoes and spent hundreds of dollars on custom orthotics that make me feel like I’m walking on concrete. None of this helped, and when I went back to the doctor two weeks ago begging to be sent to physical therapy, he told me I had to have an MRI first. I’m glad for that, because it showed that there’s a real problem, though I wish it hadn’t taken two years to get it. Hopefully, wearing this boot for the next 4 weeks will allow the tendon to heal on its own (the split is vertical; he described it as “putting your finger through a ribbon.”) I’m also hoping I don’t wind up, down the road, in a boot on my right foot, because I won’t be able to drive at that point! Wearing this boot definitely slows me down. We live in a split-level house (stairs everywhere!) so that’s a challenge. Getting in and out of the car is a challenge; this foot takes up a lot more space than it used to, and it doesn’t bend. All in all, I have to move a lot more deliberately. This means that I try even harder than before never to leave a room empty-handed, to remember all the things I need to gather up when I’m in one part of the house so I don’t have to go back there too many more times, figure out ways to do some jobs while sitting down, and work to reduce the number of steps (as in footsteps) in any given task. I could really use some Gilbreths around here right now. 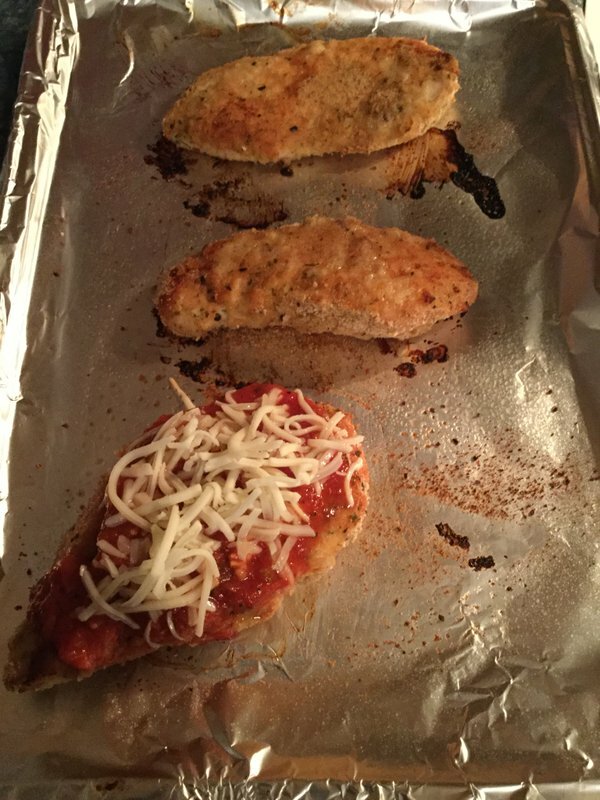 But I’m finding that it’s good to be intentional about what I do, even when we’re only talking about baking the chicken breasts instead of frying them for last night’s chicken parmesan. In a season that’s all about mindfulness, I’m in the right place. I have to be mindful about every little action, even the tiny ones like stepping out my front door and turning to close the door behind me (I almost fell yesterday, doing that simple thing, because I didn’t think about which foot needed to leave the house first). Good advice, both for my foot and for my soul. Up on the housetop, the kids hung Christmas lights. 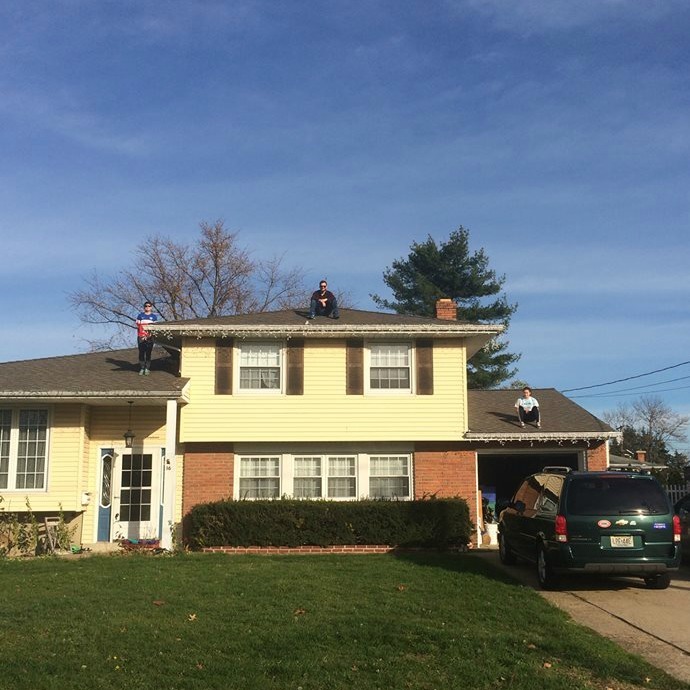 The weather today was warm and clear and not too windy; all the kids were home, so Hubs sent them up to the roof to hang Christmas lights–like about half the people in our neighborhood. After the initial trial run to make sure Russ had checked every bulb, I unplugged those lights and that’s how they’ll stay until Sunday. 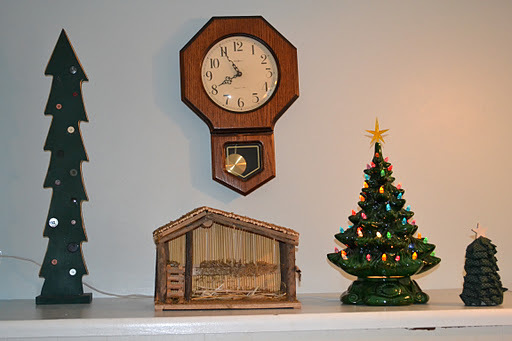 We don’t go whole-hog on Christmas decorating around here until well into the Advent season. I like to bring things in gradually. Way back when Middle Sister was little, she used to bug us about the Christmas tree. She’d have been happy to have that tree up on Halloween. (I think that’s because her birthday is two days after Christmas, so if Christmas was coming, her birthday would not be far behind!) But in the interest of not rushing the season, we decided that we’d save Christmas-tree decorating until “Pink Candle Sunday.” She’d be able to see very easily, without being old enough to read or use a calendar, when it would be Christmas-tree time. And that’s become the custom in our family every since. First Sunday of Advent I bring out the Advent wreath, Christmas storybooks (when the kids were little) and the empty manger scene. Nothing else. Second Sunday of Advent I hang a few pine garlands around the house and put up some other decorations. Pink Candle Sunday is Christmas-tree day. Fourth Sunday of Advent, the rest of the house decorations–and animals (only) in the manger. Christmas Eve: Holy Family in the manger. Christmas Day: shepherds in the manger. Epiphany: Wise men in the manger. I take the tree down after Epiphany, but often we keep the manger scene up until Candlemas. When the kids were little, we used to bring out their toy Nativity scenes (we had this Playmobil one as well as a soft fabric one) at the beginning of Advent. These toys were only played with during the Advent and Christmas season, so the kids really looked forward to having those again. Keep it simple. 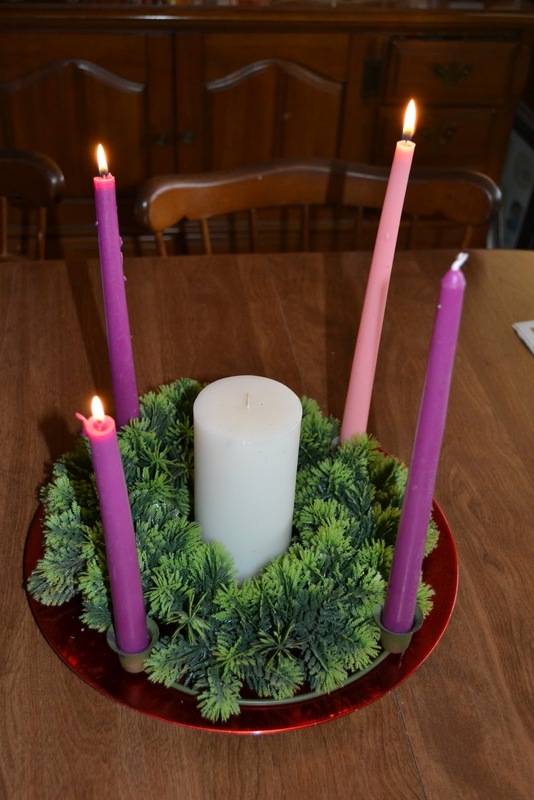 Remember, the point of Advent is preparing a place in your heart. And that’s hard to do when you’re running around like a crazy person.